Designed for the discerning traveller, our superior rooms are a haven of simple style and comfort with many extra details. Each of our superior rooms has been thoughtfully designed with original paintings and artwork, furnished to create a memorable stay. Our 7 rooms are comfortable and practical, equipped with beautiful private bathrooms. 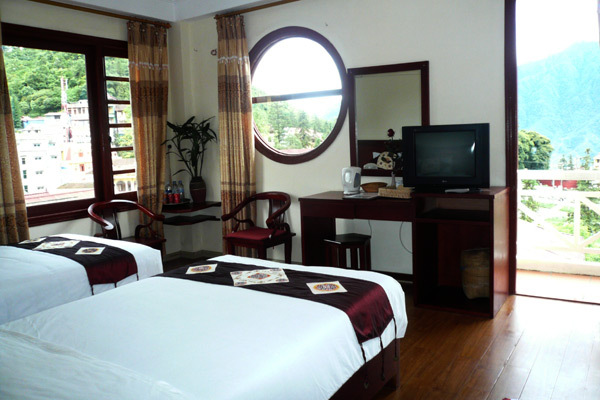 All rooms have wooden floor, some with balcony and view to the Dragon Jaw Mt. Room amenities: Reversible Air Conditioner, Bathroom-Private, Coffee/Tea Making Facilities, Dressing table, Fresh Flowers, Hair dryer, Iron/Ironing Board - on request, Mineral/ Bottled Water Available, Mini Bar, Mosquito Nets, Room Safe, Table Lamp, Toiletries, TV - Cable/ Satellite, TV - Local, Umbrella, Wardrobe, Work/Writing Desk, Alarm/Clock Radio, Slippers, Some with Balcony, Fruit basket, Towels, Hot and Cold Water, Internet access in room. Our Deluxe rooms are 26 square meters of luxury and comfort with the spectacular view to the town and the Fansipan Range. Each Deluxe room has large ensuite bathroom with shower and bath-stup, one queen size bed with the option for extra beds. Our Deluxe rooms have been thoughtfully designed with original paintings and furnished to create a memorable stay. 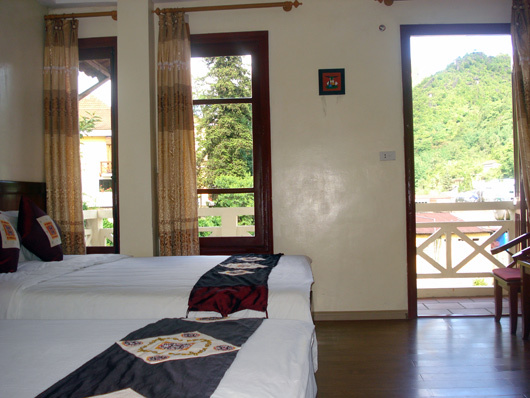 All rooms have wooden floor, balcony, opened for fresh air in Summer and are heated in Winter time. Room amenities: Reversible Air Conditioner, Balcony, Bathroom-Private, Coffee/Tea Making Facilities, Dressing table, Fresh Flowers, Hair dryer, Iron/Ironing Board - on request, Mineral/ Bottled Water Available, Mini Bar, Mosquito Nets, Room Safe, Table Lamp, Toiletries, TV - Cable/ Satellite, TV - Local, Umbrella, Wardrobe, Work/Writing Desk, Alarm/Clock Radio, Slippers, Fruit basket, Towels, Hot and Cold Water, Internet access in room. All rates are in American Dollar, including daily breakfast of the night stay, Laocai train station pick up, 10% VAT & 5% service charges. Special discount for long-term staying guest. Free! If cancelled up to 2 days before date of arrival, no fee will be charged. If cancelled later, the first night will be charged. Free! All children under 11 years stay free of charge when using existing bedding. There is no capacity for extra beds/cots in the room.